AS you might remember, I have posted a blog about Department of Tourism's campaign for this year's Independence Day celebration. I do believe that now is the great time to savor the country’s finest cuisine! Philippines is known for its wide variation of dishes combined with unique blend of authenticity and creativity. Bayview Park Hotel Manila, being a favored hotel in the the country’s premiere tourist capital, have set up month-long event which started last May 28 and will culminate on June 31, 2012. 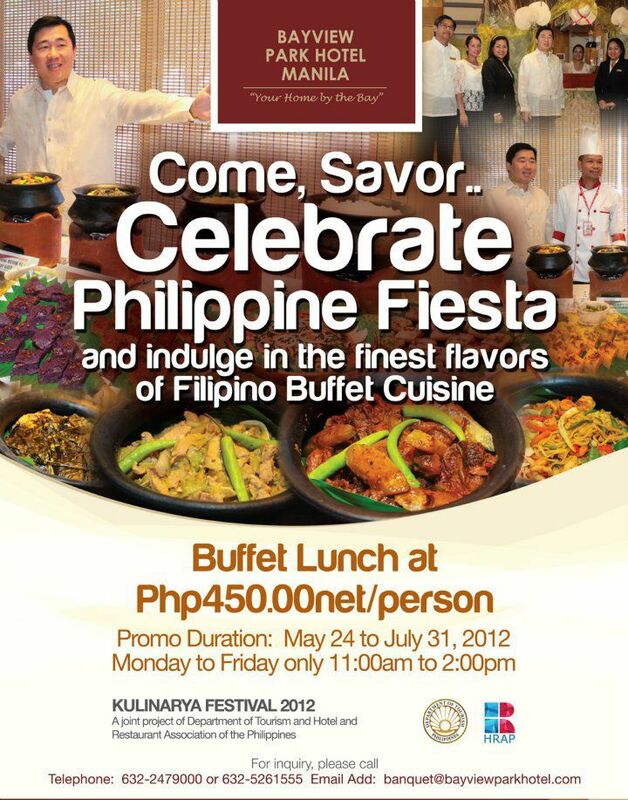 The event aims to showcase Philippine food, arts and craft at Lobby Coffee Shop of Bayview Hotel. 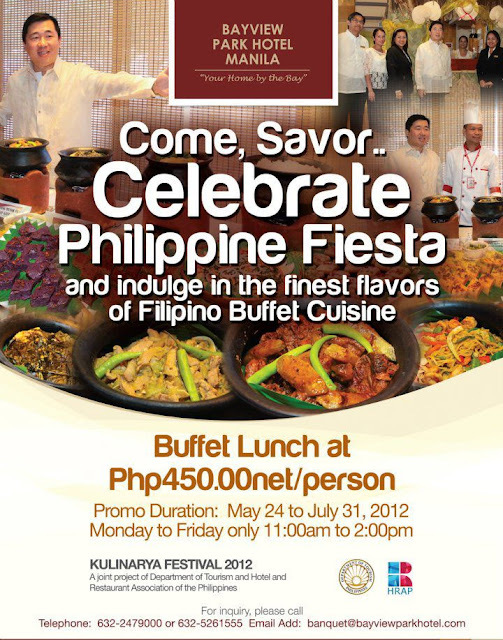 Anybody who has the penchant for delectable Philippine dishes will enjoy a competitively priced buffet lunch for only P450/person from 11:00am to 2:00pm, Monday o Friday.. In cooperation with the Department of Tourism’s “Kulinarya Kalayaan Food Festival,” also participating under Hotel and Restaurant Association of the Philippines, Bayview Park Hotel Manila Coffee shop is brilliantly decorated with a Filipiniana motif to complete the festive-look. 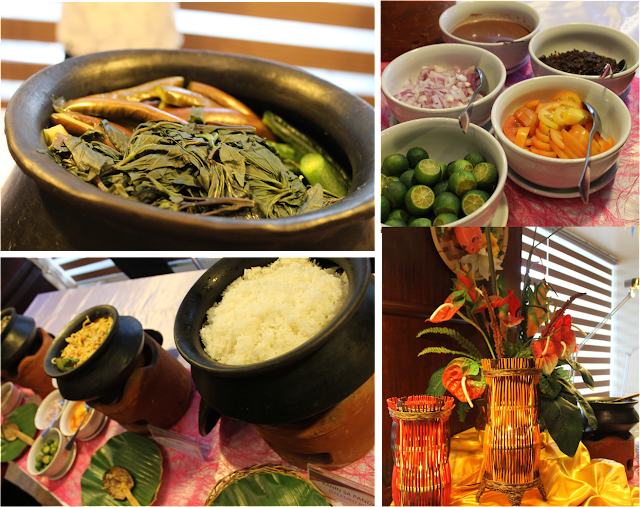 On top of this, the hotel’s in-house chef will formulate Filipino dishes highlighting the specialty of our national heroes’ favorite. 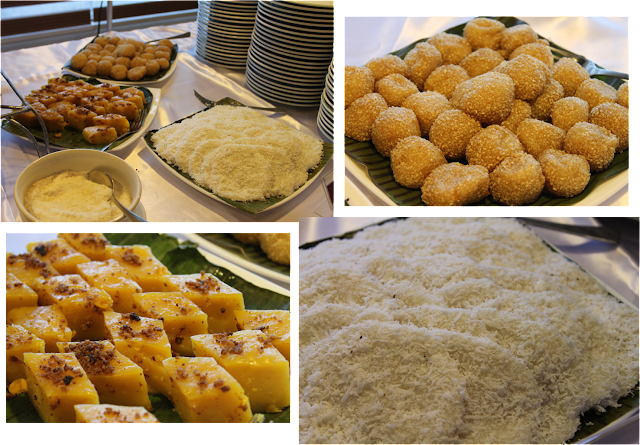 When we had a visit at the hotel for the media launch, we were taken aback and have had a homey lunch with all the Filipino fares our folks love to have anytime of the day. Filipino dishes for a fact is not only tasty but also nutritious, like "Tinolang Isda with Imelda Leaves (malungay leaves), Grilled Stuffed Pusit, Chicken Ala King, and fresh sliced local veggies which can be combined with fish sauce, sliced green mango, shrimp paste, calamansi and a lot more. If you feel like getting a fill of some native delicacies or "kakanin," feast with their special buchi, Maja Langka, and my childhood favorite, Palitaw.. Ooohhh, I feel like driving to Roxas Boulevard and running towards the buffet now. It's never too late to have your Halo-halo even in June, in fact Bayview Cafe's buffet includes a make-your-own halo-halo with ingredients that sure you could indulge with. The people who were with me were actually raving about how good their leche flan was. 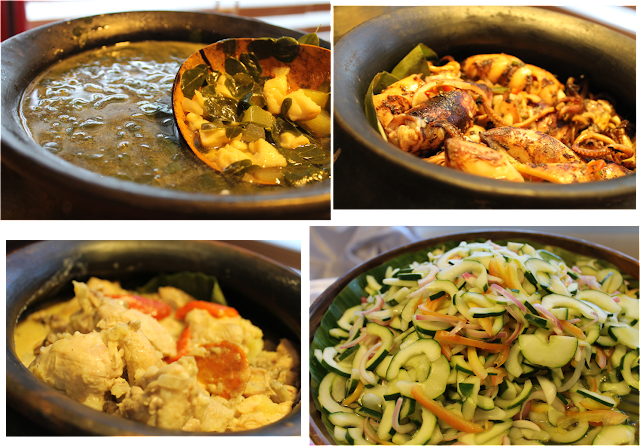 Come and visit Bayview Park Hotel Manila and discover illuminating insights on the country’s widely diverse classic recipes amidst the romantic and historical corners of the Bayview Park Hotel Manila. Filipino dishes are the best! Is Bayview Park a five-star hotel? The food lookes great how are the accomodation so far? 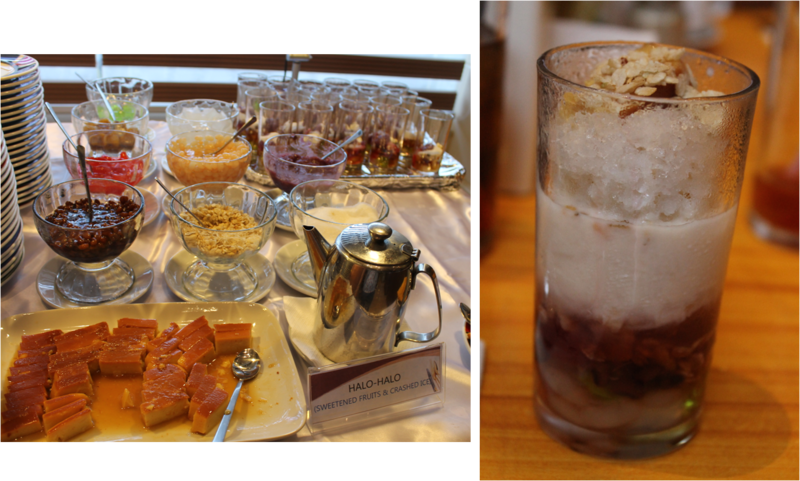 the halo-halo look delectable, missing Pinas so much! wow. I definitely missed out on this. That's a really good price for a buffet spread like this!